For the third year in a row, I got to participate in a Breakout Session Presentation at SolidWorks World. Today was not only the start of the conference, but also the day of my presentation on Custom PCB Design in SolidWorks. I had an absolute BLAST giving the presentation. The questions from the audience were just flat out GREAT, and the feedback I received from several folks after the presentation just about left me speechless. I’ve been really going through the presentation for weeks now trying to make sure it had all the material in it that it needed and I’m really happy with the end result today. Coming soon to the site will be first, a link to download the Power Point presentation ALONG WITH the files used in the presentation. A little later after that we will have a full length video of the presentation that will be publicly available to anyone who wants to see it! A big thanks goes out to my employer, Dynetics, for letting me use an internal product as an example for this presentation and to ECAD Layout Engineer Terry Prestwood of Dynetics who looked over the slides that deal with ECAD software and gave me some very helpful pointers! 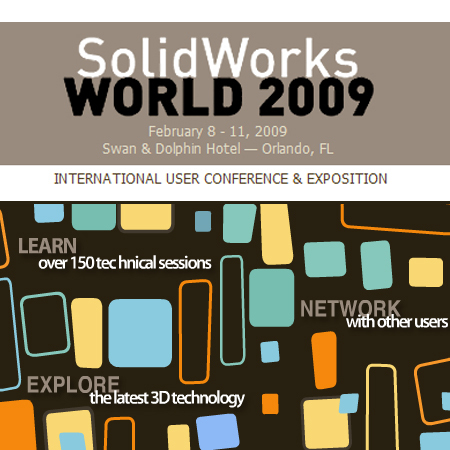 Stay tuned….much more to come from SolidWorks World 2009!! Vote NOW for Your Top SolidWorks Enhancements! I'm glad you liked the presentation. I had a lot of fun giving the presentation at SolidWorks World. We will be hopefully posting a video of the session in the coming weeks. look forward to seeing the presentation, is there a link available yet? I bet you're overjoyed having those feedbacks from the audience after your very own presentation. That's one great experience to attend such a presentation. Nice presentation!I am really enjoy to visit your well presented post..Great work done keep it up!